Conchiglioni is Italian for LARGE SHELLS. Suitable for stuffing and oven baking. Our recipe suggestion: chill them with cold water, simply stuff them with ricotta or soft cheese and spinach, arrange them in a single layer on an oiled oven dish, coat with tomato sauce and generously sprinkle with parmesan cheese and finally oven bake like a pie. 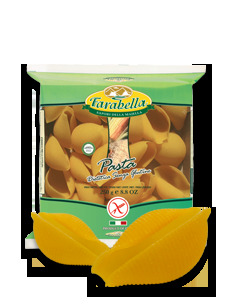 Boil a large pot full of water: allow not less than 3 liters of water for 500g of short pasta. When it starts to boil, add approx. 5g of kitchen salt for each liter of water and put the pasta in. Stir gently with a wooden spoon. After 5 minutes boiling remove the pan from heat, cover it and let the pasta rest in the hot water for other 2 minutes or until it reaches your favourite cooking style. Do not stir the pasta. Once cooked add plenty of cold water to the pan to prevent the Conchiglioni from cooking further. Remove each Conchiglioni singly, and stuff each one with the stuffing of your choice and place each stuffed Conchiglioni individually in a greased oven-proof dish to form just one single layer. Pur selected sauce over and top (if wished) with Parmesan cheese. Bake in a pre-heated oven (350 F) for about 25 to 30 minutes. Serve either as a starter or main course. After cooking strain quickly and serve still hot.